3 Bedroom Detached Bungalow For Sale in Middlesbrough for Guide Price £215,000. Fully refurbished and extended residence situated within the popular residential estate of Wainstones Drive. 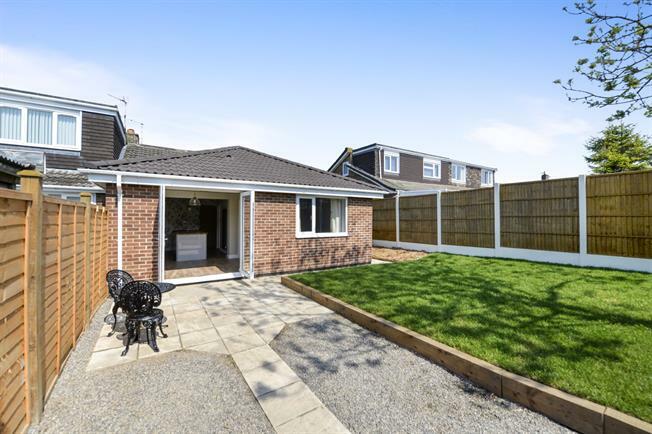 With open green to the front of the property and garage to the rear, the prime positioning of this delightful bungalow provides a great deal of light and space. With fantastic extension to the rear, the open plan kitchen-diner-sitting room, provides a brilliant and beautifully designed area to enjoy this newly fitted kitchen and its views over the private rear garden. Welcoming entrance hall with doors leading to most rooms. Spacious and light-filled living room with window overlooking the green to the front aspect. Superb and spacious, this newly fitted kitchen offers a wide range of wall and base units, with integrated appliances, opening up to a generous dining/living area with double doors overlooking the rear garden. With views overlooking the rear garden. With window to the side aspect. Beautifully designed, fully tiled with WC, hand wash basin and bath with overhead shower. The property offers pretty lawn and borders to the front aspect, with low maintenance garden to the rear, complete with patio area and path leading to the garage.